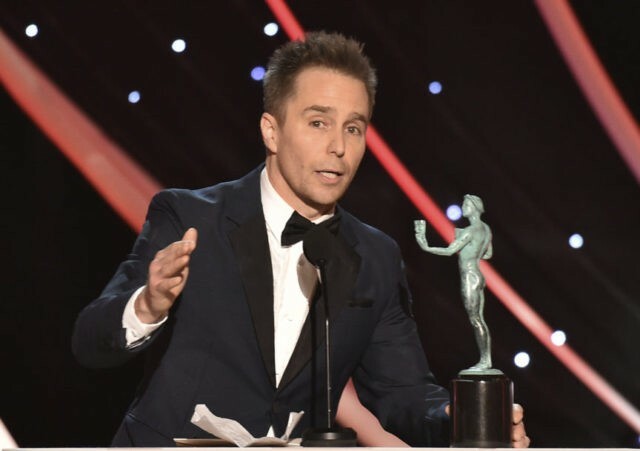 LOS ANGELES (AP) — The Screen Actors Guild Awards is tipping the scales for some Oscar hopefuls with early supporting actor wins Sunday for “I, Tonya’s” Allison Janney and “Three Billboards Outside Ebbing, Missouri’s” Sam Rockwell. But it is the treatment of women in Hollywood and beyond that remains at the forefront of the show, which features a roster of almost all female presenters, and Kristen Bell as its inaugural host. Rockwell, who beat out his co-star Woody Harrelson for the award, took his moment on stage to give a shout out his co-star Frances McDormand, who is nominated for her leading role in “Three Billboards,” which went into the evening with four nominations, including best ensemble. “We must create an environment in which harassment discrimination and abuse are no longer tolerated,” Carteris said. Early television wins included Julia Louis-Dreyfus for actress in a comedy series for “Veep,” which also won outstanding comedy ensemble, and William H. Macy for actor in a comedy series for “Shameless.” Macy beat out Aziz Ansari in the category and the show avoided a potentially fraught moment in his loss. Ansari was accused anonymously by a woman of aggressive sexual behavior in an account that has prompted some to question whether the encounter as described constitutes misconduct or a bad date. He accepted a Golden Globe two weeks ago while wearing a Time’s Up pin. Producers say the female-forward approach was inspired by last year’s Women’s March, but the show arrives at a time when some of the industry’s biggest names are leading the Time’s Up and Me Too movements to address gender inequality, sexual misconduct, pay disparities and other issues. Lifetime achievement award recipient Morgan Freeman kept his remarks quite brief after a moving highlight reel of his expansive career and an intro from Rita Moreno. The Oscar-winner for “Million Dollar Baby,” and four-time nominee, has over 80 films to his name. The brisk show comes two weeks after a black-dress protest at the Golden Globe Awards, and several stars including Meryl Streep, Emma Stone and Michelle Williams bringing activists to the show. The SAG red carpet saw the return of colorful frocks and far fewer Time’s Up pins — although some actors, like Kumail Nanjiani and Gina Rodriguez, were still sporting theirs. With many prominent men in Hollywood facing accusations of sexual misconduct, virtually every aspect of awards season has been impacted by the scandal. The SAG Awards are no different, with best film actor nominee James Franco having been accused of sexual misconduct in the days after winning best comedy actor at the Globes. For television, the drama series ensemble nominees are “The Crown,” ”Game of Thrones,” ”The Handmaid’s Tale,” ”Stranger Things” and “This Is Us.” The day’s first awards went to “Game of Thrones” and “Wonder Woman,” which were honored for best stunt ensemble honors handed out on the red carpet.